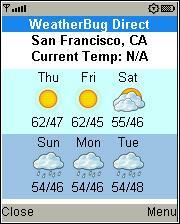 WeatherBug’s weather app. Shows 2, 3, 4, 6 or 7 (depending on screen size) day forecast for any US zipcode and major world cities. The current temperature feature is broken and always says N/A. Other options (Conditions, Forecast, Radar Maps) launch the phone’s browser and display a page from WeatherBug’s mobile site. iDEN Compatible: (tested on i776): No, Class Loading Error while installing. The app “WeatherBug Direct” (155 KB) is ready to download or send to your phone as filename: “WeatherBug”. Audio apps are in the Audio section: http://boostapps.com/category/apps/audio/ There are a couple of radio apps there that may work on your phone. If you have further questions please post then under the app they refer to. For general questions please read the help page http://boostapps.com/help/ and post comments there. No , it is a total crash . I guess it is incompatible with the Innuendo then . I get an Unhandled Exception and a warning beep when I try to save a city on my Innuendo . Any tips would be appreciated . The beep when you save the city is normal. The exception is not and indicates an incompatibility with the phone. Can you press OK and continue to use the app after the exception? thank you.jeesh lol works god on the incognito.